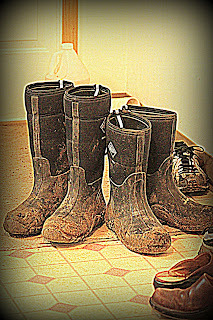 I'm thankful for Muck Boots. It really felt like winter was around the corner when I had to break out my Mucks today. We are fortunate to live in an area of Oregon that doesn't get a lot of mud, but lately we've gotten quite a bit of needed moisture, and while things aren't muddy, they are a bit "greasy"
as Clint likes to say. I grew up in Western Oregon where I'd go through a pair of Muck boots a year, you didn't buy a jacket without it having a hood, and everyone walked to class with an umbrella in their backpack. 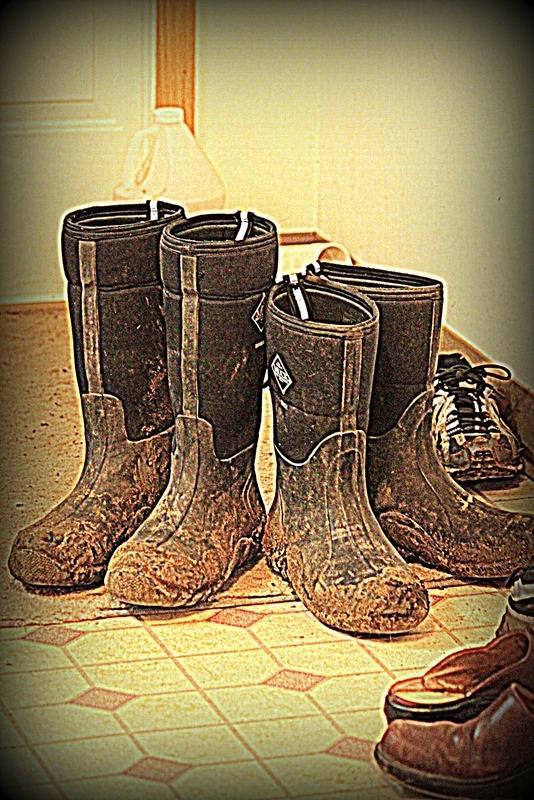 But here in Eastern Oregon, we don't get a lot of mud, but when we do, I'm always thankful for my Mucks. Clint was helping over at the feedlot this weekend, so I tried to help him and do some of things he normally does on our side of the freeway. I needed to pull a sick heifer out of a pen and since I don't ride, Clint thought I would be able to pull her on foot. He was right - she was easy to sort and I was able to get her to the chute. (She had a potato stuck in her throat, but after a little searching I found a 5' hose & some mineral oil that helped me help her feel better. Like many others in our area, Double M includes potato by-products in their ration, and this happens sometimes....it's pretty easy to diagnose and fortunately, fix.) And because I had my Mucks on, it was easy to get into the pen and get her pulled without filling my tennis shoes with mud and manure. Muck Boots & a 5' Hose. It's the small things in life here on a ranch, right?